This Friday, April 17th, join Lana Crooks at Light Grey Art Lab in Minneapolis! 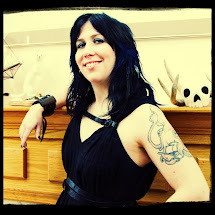 She is here to chat about skeletons, exhibit a number of wool specimens and eat some insane doughnuts! Guts features new work by 60+ artists from around the world. Artists have made a variety of fiber sculptures, hand-sewn details, intricate illustrations, and paintings that share the truths, uncovered mysteries, and fabricated stories behind some of life's greatest questions!